We've got spirit, yes we do! We've got spirit, how 'bout you?!? Sorry, we didn't mean to shout, we just get so pumped up by cheerleader routines! They make us feel like we're at a big high school homecoming game, the stands are packed, it's fourth quarter with just a couple of minutes left on the clock, and the score's tied, neck and neck. It's time to make some noise for one final drive down the field! Once the cheerleader squad gets the crowd rallied together and singing the team's fight song, they're sure to win! Phew, sorry again. As you know, cheerleading and football are a pretty big deal. 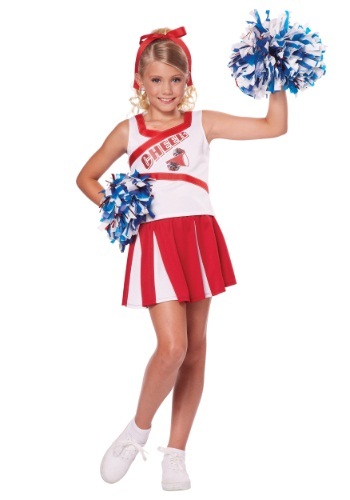 Do you have a kid who dreams of being the captain of the varsity cheerleader squad some day? If so, they'll get a huge kick (and maybe even a some back flips) out of this High School Cheerleader Costume! Being great at getting everyone's spirits up takes a ton of practice, and she's still got a few years to go until high school. Working on her rhyming and dance routines in this bubbly outfit is a good way to get a leg up on the competition when she tries out for real! Your little athlete-in-training can show off her cheerful energy in this sporty skirt and tank top. It looks just like a real cheerleader uniform from a high school squad, and includes a matching hair ribbon and a set of pom poms to wave around. She can complete the look with her own running shoes, and any other tools needed to get a crowd's attention, like a megaphone or some streamers. Everyone will get into the spirit when she's leading the cheers!